You showed your dad how to work his cell phone. You assisted Grandma in setting up her Facebook (and now you regret it). Tech stuff? You just seem to get it. Now there’s an opening on a top company’s help desk staff. They provide free coffee, office chairs with lumbar support, and a health package that would make Bernie smile. All you need is a great help desk resume. You want that help desk job? So do many others. There’s many people in this help desk queue - lots of competition out there. We both know you’re not just another help desk jockey. You’re the Skrillex of the help desk scene. Leading companies want the best and most knowledgeable. You’re the best and most knowledgeable. Now let’s give them that hit they’ve been waiting for! A great help desk resume is a Top 40-ranking single, and the cover letter is your EP. Follow this guide and write a creative help desk resume that will set the roof on fire. A help desk resume example better than 9 out of 10 other resumes. How to write a help desk resume that will land you more interviews. Tips and examples of how to put skills and achievements on a help desk resume. How to describe your experience on a resume for a help desk professional to get any job you want. 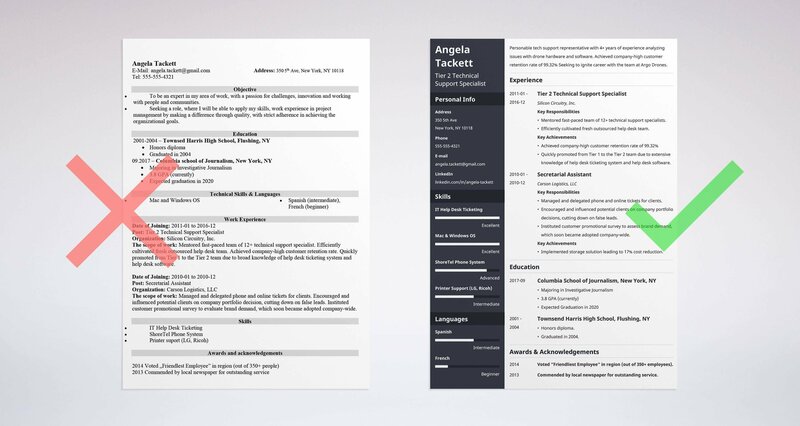 Here's a sample resume for a help desk specialist made using our resume builder. 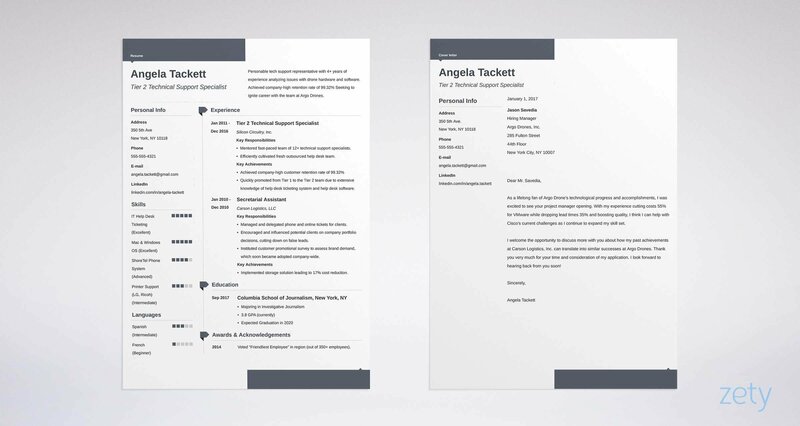 Help Desk Resume Examples - See more templates and create your resume here. What’s the Best Format for a Help Desk Resume? Most of the time, hiring managers won’t read your whole resume. If they read it at all. It gets worse: they take only 6 seconds to scan a resume. That’s 6 seconds to consider you for an interview. You need a good help desk resume format that will grab their attention and not let go. Been on a help desk team before? Fantastic! You’ve got an advantage. The reverse-chronological format is best for your experienced help desk resume. The reverse-chronological format emphasizes your help desk work history and experience. Using this format on your IT or computer help desk resume, you will list your most recent work positions first, and go back through past jobs from there. As the standard format, it’s the easiest to read and scan - for hiring managers and applicant tracking system (ATS) software alike. This is important because those little ATS robots read your resume first and make sure you’ve got the goods the hiring manager wants. But more on that later! But, how to get a help desk job using a resume without experience? This is where the combination resume format comes in. Using this format on your sample help desk resume, you’ll highlight relevant skills on previous jobs. Feature them in bullet points to make them stand out. List them under appropriate subheadings like Communication Skills. In your work history, include key tasks and duties with each job. Focus on those which translate to similar actions on a help desk. These are “transferable skills,” which we’ll touch on more below. Don’t have any past work experience? No problem. Instead, begin with your education. Follow that with non-traditional work (e.g., internships) in the work history area. Help Desk Resume Summary or Resume Objective? You want to make an impression. You want to draw them in. You want something they’ll be unable to forget. Remember that you have 6 seconds? You’ll want to do this all quickly. You need a resume objective or a professional resume summary. Don’t worry! We’ll go over the two now, and you’ll be able to pick the best one. You’ve been assisting customers with their new tech ever since tech was new. You’ve got help desk experience? Then use a resume summary. Your help desk resume summary will point out your tech support skills and achievements like a tech support agent pointing out problems on a PC. Highlight your career experience in a brief introduction. This will show them that you’re the right person for the job. Pro Tip: Personalize the resume by professionally name-dropping the company you’re applying to in the help desk resume summary or objective statement. Personable technical support representative with 4+ years of experience analyzing issues with drone hardware and software. Achieved and maintained company-high customer retention rate of 99.32% Seeking to ignite career by growing with the team at Argo Drones, Inc. I have been a tech support agent for the last four years. Besides my knowledge of drone hardware, I also carried out various office duties (e.g., filing, accounting) during downtime. Let’s debug. Take the “Wrong” technical support resume sample summary: It was sweet of you to perform those different office tasks during off-peak hours, but, at the same time, who cares? Those skills aren’t relevant to a technical help desk resume. Also, steer clear of using the first person in your resume. The “Right” tech support summary example quantifies your experience (4+ years) and also adds one of your proudest accomplishments for the win. Pro Tip: Aim for one page on a help desk resume with no experience. Two pages for career help desk job seekers. More than two pages might get overlooked, whether it is a tier 1 IT support resume or a tier 3 computer support technician resume. The pinnacle of your help desk experience so far (and the biggest regret of your life) was when you helped your grandma create her Facebook account. New to the field? Will this be a resume for a help desk job with no experience? You don’t have the necessary experience. But I repeat: don’t worry! Instead, we’ll explain how your past skills will be useful on technical support resumes. Don’t forget to mention the company name! Personable sales representative with a keen interest in drone hardware and software. Seeking to use proven marketing track record and region-high sales conversion rate of 89.7% to invigorate and grow with the team at Argo Drone, Inc. I have been a sales rep for the last four years, and I am looking to become a help desk agent with your company. I don’t have knowledge yet, but I’m willing to learn. How about here? Do you see the differences? While in the “Wrong” example, you show commendable ambition, everyone shows that in their resume. The “Right” technical help desk resume example shows our that our experience, though unrelated, can be relatable. And a proud achievement in there to seal the deal. The company is taking a bigger chance on you if you’ve had no previous help desk experience. So, it is even more important to show them that you have what it takes. On the help desk, you’ll help some clueless people with self-inflicted problems while maintaining the patience of a saint. To cast a spell on the recruiters, you must know how to describe your work history by creating the perfect help desk resume job description. Know your IP address better than your home address? If you have experience on a help desk team, you have a nice head start. Still, pick those help desk resume bullets which match the company’s interests. Complicated? Mentored fast-paced team of 12+ technical support specialists for over four years. Quickly promoted from Tier 1 to the Tier 2 team due to extensive knowledge of IT help desk ticketing system and help desk software. Efficiently cultivated fresh outsourced help desk team and remote help desk jobs. Completed technical support specialist training. Answered IT support phone calls and emails. Helped resolve complex technical issues. Did various other tech support duties and IT help desk jobs. Do you see the difference? In the second example, we list our help desk duties and responsibilities. Short and sweet, right? It won’t be sweet when they short you the job. Now, take the first help desk support resume example. We list achievements and successes at the previous position, with some modifying words that will impress them and benefit you. Almost any past experience will have something which is relevant to a help desk resume. Analyze tasks you had that would be useful on a resume for a help desk job. These are transferable help desk responsibilities and skills. Handled the calendars of corporate titans as a secretary? Impressive! But not transferable. Delegated and managed phone calls and emails from clients? Now that’s transferable! Managed and delegated phone and online tickets for clients. Encouraged and influenced potential clients on company portfolio decisions, cutting down on false leads. Instituted customer promotional survey to assess brand demand, which soon became adopted company-wide. Answered phone calls from clients. Responsible for filing and retrieval of documents. In charge of managers’ calendars and scheduling. On our entry-level technical support resume samples, sure, we could list our secretarial duties like filing documents and jotting appointments down into calendars. But, since we want a help desk position, we need to list the most tasks and achievements which would be relevant to IT help desk responsibilities. In the first one, we highlighted our tasks which are most relevant, and then we add a proud achievement for the win. Pro Tip: The one-word ‘helpdesk resume’ is quite common, but incorrect by most authorities. Even if it were, keep it consistent - choose one spelling and stick with it. The education section. What a waste of valuable real estate on your help desk resume, right? An education section is a key part of the perfect resume. Whether you are submitting an entry-level help desk resume or a tier 2 help desk analyst resume, the hiring manager will appreciate your academic recap. So, how should we list education on our help desk resume? If you’re going to list a degree, skip adding your high school. Pro Tip: For the best help desk technician resume, you should only include your GPA if it is as close to 4.0 as possible. Too low and it’ll hurt instead of help. We don’t want that! The skills section is as important as a tech support agent understanding your OS. Tailor this to the employer by choosing the perfect listings. And it doesn’t end there - we also need to identify the right help desk hard skills and soft skills. Pro Tip: Hard skills are specific abilities and know-how (e.g., Microsoft Azure Active Directory). Soft skills are self-developed, life-learned attributes (e.g., safety consciousness, adaptability). These are great IT help desk services to have for the average help desk applicant. But you’re not average, right? So no generic terms. Now it’s time to scrutinize the job listing and underline resume keywords - the most important phrases in the job offer. Just like when someone calls us for some IT support, we need to tailor the response to match. We want words that fit the job like an ergonomic office chair. In the second one, your laziness is evident. 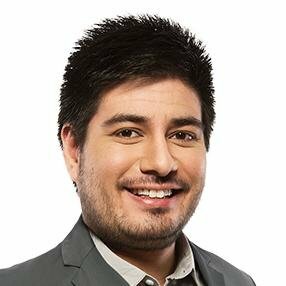 In the first one, you look like the Chosen One, ready to lead the company into the help desk promised land. So, you know how to use the ShoreTel phone system. That’s good. But, let’s go for excellent. Trained 30+ new employees with ShoreTel phone system. Here, they’ll understand that we know the particular phone system. Rather than a vague knowledge, we show that we have years of hands-on experience. Pro Tip: Try this: Type a bunch of your skills into an Excel column, with a number (1-10) of importance and help desk relevance in the adjacent column. Then, trim that fat until you have the best 5 or 6. Contact info, check. Resume objective-slash-summary, got it. Experience, education, skills - everything seems in order. Time to send it off! Everyone since the dawn of time has added these sections to their help desk resumes. Want to really tip the scales in your direction? Then you need to add some other sections. If you have some experience outside of work and school, list that on your help desk resume. If you’ve volunteered at a summer camp, you could easily add this to your “Experience” section. Voted “Friendliest Employee” in region (out of 350+ employees). Commended by local newspaper for outstanding service. Volunteered bi-weekly at local animal shelter. Voted “Most Likely to Succeed” in high school yearbook. Remember - relevant! That first one uses numbers and specifics to paint a picture of your talent. The second one is irrelevant, especially for a help desk resume. Also, add two or more creative help desk resume bullets. If you can only think of one, skip it (unless it is a big one). Pro Tip: When wrapping up, save your resume as a PDF. Your help desk resume PDF will keep your layout intact while presenting it in a popular and easy way. Peanut butter without jelly. Tricks without treats. Resumes without cover letters. They are all missing that one thing which completes them. But they’re so boring! And more than half don’t need it. True, but you cut your chances in half if you don’t take the time to write a good help desk cover letter. So, here’s a better idea: we’re going to make the best help desk cover letter possible. Do you like getting emails addressing you as Dear User? Of course not. Neither do hiring managers. Address the hiring manager by name in the help desk cover letter. It works like a dog whistle. Cover letters are more than resumes with proper sentences. They are the difference between calling support and speaking to a live human rather than a terrible robot. You don’t want to sound like a broken record. Don’t regurgitate the contents of your help desk resume but rather expand on your key selling points. Use the cover letter to prove you can deliver on your promises. Mention something about the company that you relate with. You dropped their name and caught their attention - now seal the deal with this next personalization. Positively grab their attention - it will mean more than degrees and certifications you list in your professional help desk resume. Pro Tip: Research the company online and mention something in particular that stands out to you. This is something a resume can’t include and can really catch their eye! Did you know that our resume builder will also help you write a professional help desk cover letter for the job of your dreams? For more, read our cover letter tips or find out exactly what to include on a cover letter. Using this formula for a help desk resume and cover letter, you will have the key to unlocking many doors of opportunity. You want to join them, so make them need you. Use help desk resume action words and impressive achievements to wow them. Make your case by painting the best picture of yourself. Double- and triple-check. Spend an extra few minutes making sure that your resume and cover letter are up to par. Now. You should have the most attention-grabbing, best help desk resume out there. It’s time to attach the final help desk cover letter and resume to an email and send it off. Fingers crossed! Do you have any questions on how to write a professional resume for help desk specialist positions? Not sure how to describe your skills or achievements? Give us a shout in the comments, and we’ll answer your question.